I’m kicking back at the beach in Waikiki where it is super humid and the tropical sun is blazing hot. This brings on problematic skin so I was certainly on the hunt for a way to soothe and revitalize my complexion without paying outrageous prices. After all, Hawaii is expensive and I wanted to be frugal as possible but look and feel refreshed as well. 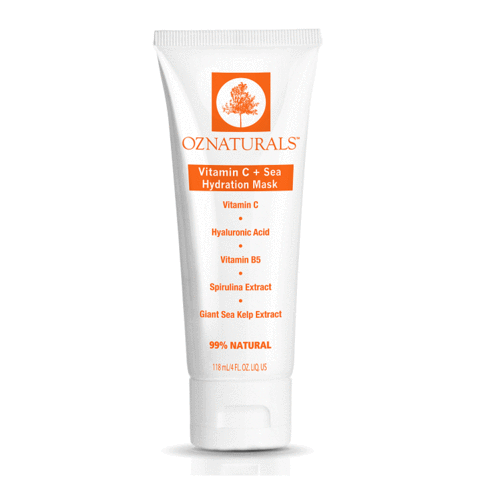 I found the answer with the new OZNaturals Vitamin C + Sea Hydration Mask! Packed with Vitamin C, Giant Sea Kelp Extract, and ocean minerals, this deeply hydrating formula reduces redness, fine lines, and flaky skin, delivering radiant, youthful skin and a dewy, healthy glow. Formulated using a unique technique called Cold Processing, OZNaturals products are made at room temperature, which allows the active ingredients to remain fresh and highly potent as intended. In addition, this amazing mask does not contain parabens, petrochemicals, phthalates, GMO ingredients, sulfates, and other potentially harmful synthetic chemicals. Full of antioxidants and fatty acids, this effective, yet natural formula soothes even the most distressed skin and best of all, will reduce that awful puffiness and inflammation. What makes OZNaturals’ mask one of the best? At OZNaturals, they have always taken a science-based approach to their formulations, using high quality ingredients that have been proven to be effective. With OZNaturals Vitamin C + Sea Hydration Mask, you are receiving proven antioxidants in the form of Vitamin C and marine extracts that can help improve the look and feel of your skin, while fighting the damage done by free radicals. Hyaluronic Acid – another well-researched and proven ingredient – delivers unparalleled deep hydration. This key ingredient is a very important component of skin tissue. One of its primary functions is to attract and bind water – about 1,000 times its weight in water, in fact. In addition to these high quality ingredients, they include nourishing sea extracts with anti-inflammatory properties along with Vitamin B5, another natural humectant. At OZNaturals, they believe what you put on your skin should be good for both you and the planet – and should never contain substances which could be potentially harmful to either. They have been committed to producing the most effective, beneficial natural skincare products. They are also deeply committed to cruelty-free formulations and non-animal based products. For example, the hyaluronic acid they use in their Vitamin C + Sea Hydration Mask (and many other OZNaturals products) is botanically derived from the seeds of a native Indian plant, Cassia Angustifolia. This is not always the case with other products and companies, which (sadly) may use Hyaluronic Acid derived from rooster combs! They company strives to be environmentally conscious and sources their materials and suppliers carefully. They realize that natural and organic raw ingredients can often be more expensive, but they are uncompromising when it comes to quality. They have made it their mission to deliver the most natural and effective products available, while keeping their prices accessible to all. Their Vitamin C + Sea Hydration Mask is an excellent example of their dedication to high quality ingredients in an effective formulation that does not cost a fortune. Affordable enough to use every day if desired, this innovative mask delivers spa quality results at a fraction of the cost. I just love it, and it’s just what my complexion needs right now in changing climates. The complete OZNaturals Collection is available online at OZNaturals.com and Amazon.com. FREE STANDARD SHIPPING IN THE US AND CANADA. Thank you for sharing some of your time with me today at The Badass Writer. Be sure to share this post on social media and subscribe so you don’t miss a thing!